Kroger Cart Buster Event and $25 Gift Card Giveaway! Are the rising costs of food causing you to think about busting your piggy bank just to put dinner on the table? Save the piggy bank, and instead check out the Kroger Cart Buster Event. From February 27th through March 12th, shop Kroger´s biggest-ever promotion and find the hottest prices around on more than 35 brands, across more than 60 categories from General Mills, P & G, Nestle, Pepsi and Kroger Banner Brands. During the Cart Buster Savings Event, you´ll find great savings in almost every department at the Kroger Family of Stores, which includes Kroger, Ralph´s, King Soopers, City Market, Dillons, Smith´s, Fry´s, QFC, Baker´s, Owen´s, Jay C Food Stores, Hilander, Gerbes, Food4Less, Pay Less Super Markets and Scott´s Food & Pharmacy. Furthermore, you can get in on daily deals, view weekly ads, and even share a video of your awesome groceries savings at the Kroger Cart Buster website. Are you interested in winning a $25 Kroger gift card to help you get even more bang for your buck? Silly question - of course you are! There are several ways to enter. Please leave a comment for each. Please include your email in your comment so I can contact you if you are the winner. Mandatory entry - How do you save money on grocery items? Do you coupon, stock up on sales, or keep a price book? Please share! Leave a comment on one of my other posts and tell me which one. The giveaway is for U.S. residents only and will end on March 11 at 6 p.m. EST. The winner will be chosen by a random number generator. Disclosure of Material Connection: A $25 gift card from the Kroger Family of Stores, information, and giveaway were all provided by the Kroger Family of Stores and General Mills/Nestle/Proctor & Gamble through Blogspark in the hope that I would mention it on my blog. Regardless, I only recommend products or services I use personally and believe will be good for my readers. I am disclosing this in accordance with the Federal Trade Commission’s 16 CFR, Part 255: “Guides Concerning the Use of Endorsements and Testimonials in Advertising. 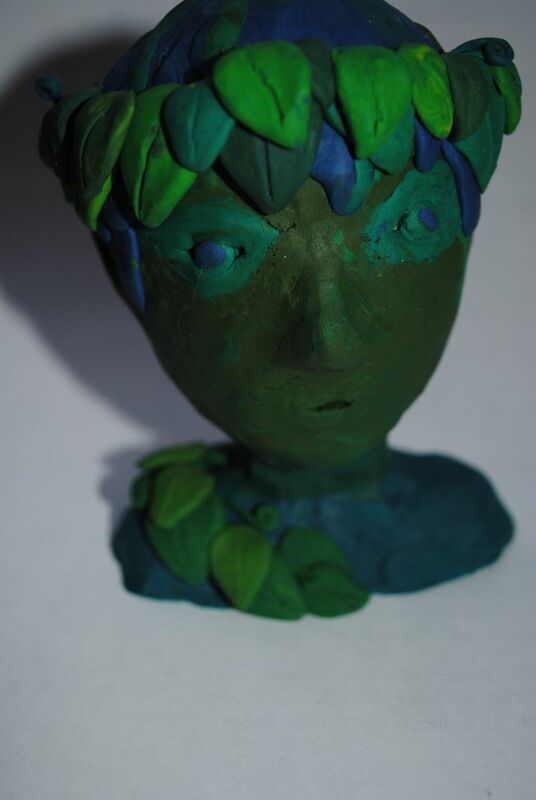 There's a nymph in my art class! Dd has really been enjoying her art class. This week the class learned about Donatello, the first great Renaissance sculptor. After a short lecture, the class was handed a Styrofoam egg, some sculpting tools, and clay. They were given instructions to observe the proportions of the person next to them, and create a human head. Apparently she was sitting next to a nymph. 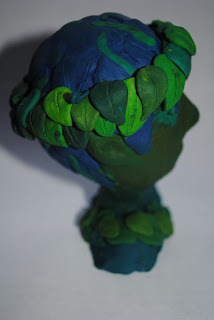 This was very easy project if you want to recreate it at home. All that is needed is a few simple supplies...and some imagination. Actually, I haven't decided yet on what I want to be when I grow up! But that is ok. I still have time. This week's Blog Cruise question isn't about me, anyhow, but about my kids. What do your children want to be when they grow up and what are you doing to help them pursue their field of interest? I've actually talked quite a bit about this recently on my blog. Every kid has ideas of what they'd like to be when they grow up. Both of my kids have been pretty consistent with their career desires and I've tried to encourage them, with the exception of a 3-year stint where my daughter claimed she was going to become a Fairyologist. Yep - she was quite obsessed and even spent a whole summer researching the existence of fairies. She's moved on to other career choices, thankfully. 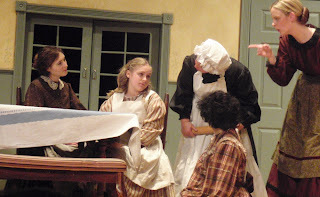 My daughter, 14, truly desires to be an actress, preferably on the big stage. Either that, or a fiction author...or both. I'm not sure which is top of the list at the moment, as the two have been competing for many years. 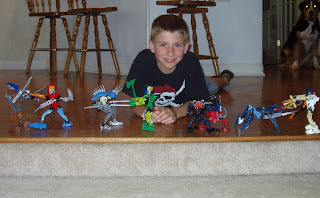 My son wants to be a Lego Master Builder. Yep, every 11-year-old boy's dream job (if they aren't shooting for some sports team). He's claimed this as his goal ever since he read in a book that this is an actual job title. So, how do you work with such lofty career desires? Yes, there are people out there that are successful actors and Lego builders...someone has to do it, right? But how does one encourage kids with such dreams, knowing that chances are slim, without being discouraging? The answer is in the question. How do I help them pursue their fields of interest? To further break this down, what skills or knowledge are required to reach a goal? Let's look at actress and fiction author careers. Both require creativity and imagination. Knowledge of literary works is helpful in both. Ability to memorize and articulate is useful for any acting field. Obviously, a writer needs to have solid writing ability, both grammatically and in content. There are also several ways in which these two desires collide into one field. For example, script writing is a blend of both. Given this, I look for activities and coursework that satisfy the above, but that are also useful in other areas. My daughter's coursework includes lots of writing and reading. She enters writing contests frequently. I find forums that support young authors and encourage her to share her work (one of her blogs). Public speaking activities are a must, and really boost a transcript as well, no matter the field. A debate team or course is certainly on our agenda. And, of course, there are plenty of theater opportunities to pursue. Now that I my daughter is heading into high school, and hasn't changed her career aspirations, I'm addressing it a bit differently. I'm seeking out real acting opportunities to try on for size. She's been taking an acting class and we are heading down the path of getting an agent. We recently were able to attend a filming and be part of a crowd scene. This gives her a chance to see it all in action and see the many specific jobs in this one field. I also try to find inject a fair amount of realism into the situation. Most in theater or acting work don't make it big. Many can't even afford to cover living expenses. I make sure she doesn't have all her eggs in one dream basket and that her educational background will support whatever. This means she needs to keep up with all math and science and that she understands that she may have to write for a newspaper or magazine while she works on that novel. Now, what about Lego Master Builder? It sounds a bit limited, no? Well, not really. I see architect, engineer, design, robotics, and electrician. All of these, including Lego Master Builder, require the ability to see how pieces fit and work together. To get an idea of what I'm talking about here, take a look at the suggested steps to becoming a Lego Master Builder here. Study and obtain a Bachelor's in art or design, experience in CAD and similar programs, creating a portfolio, research....this list does not entail just playing with Legos! Math, in particular, but also science need to be a focus. We'll include computer design down the road. I encourage the Lego creations (though stepping on stray pieces is not fun). It requires a fair amount of problem solving and creativity, which are skills that are needed in many areas. For the past two years, my son has participated in First Lego League (FLL). For anyone that has been a part of FLL, you know it is about much (much) more than Legos. 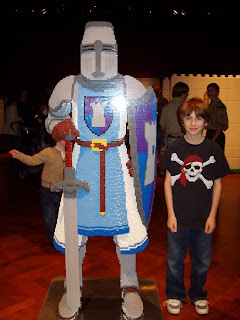 I also found this fabulous blog that gives kids Lego challenges, LEGO Quest Kids. 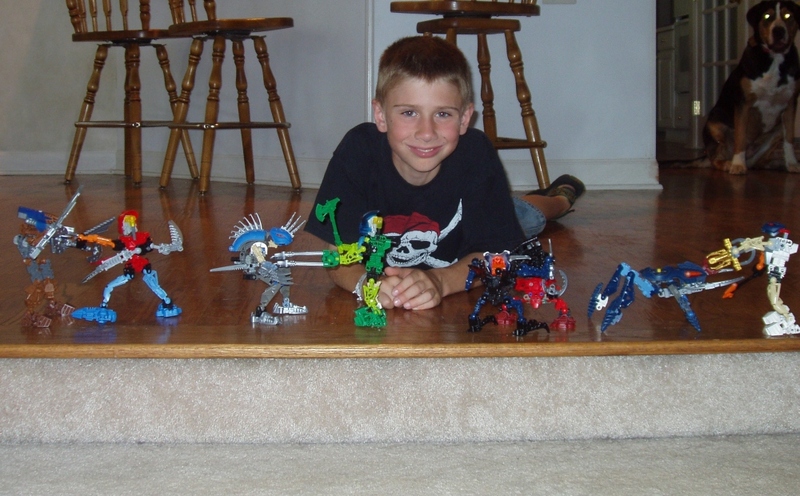 All of these activities are helpful in pursuing his Lego Master goal, which may or may not change as he becomes older, but they also are very useful in the other areas mentioned. And as with my daughter, he needs to keep up in other areas. Even Lego Masters need to write on occasion. I try to show both my kids how every subject fits in with any area they want to pursue. Pursuing one area doesn't mean neglecting certain subjects. It tends to be a balance. I don't want to dismiss either goals of either child, as much as my tainted-with-realism adult mind questions them. However, I've come to realize that encouraging such goals does not mean I am dismissing other paths. Rather, I am encouraging and preparing for other possibilities at the same time. Chances are, both of my children will end up in fields that utilize their own personal strengths. At least, that is what I hope will be the case! For my daughter, that means something creative that likely involves writing. For my son, that means designing, building, and using parts to make a whole, whether building a Lego display, designing a car, or working on the infrastructure of something much larger. I truly hope to see my daughter's name on Broadway and see my son's designs at a Legoland display or on the shelves of a toy store. Even if I don't, I know the skills they've obtained in pursing those dreams will benefit them greatly no matter what they do, and may even find something they love more in the process. While their "field of interest" may seem rather narrow at the moment, I've come to realize that continuing to encourage that interest only makes the path wider and reveals a multitude of rabbit trails. My job is simply to not put roadblocks on the path. It is pointing them in a direction, inspired by their interests, while clearing the path as much as I can, to a final destination not yet known. World Math Day 2011 is coming March 1, 2011. Registration is in process! To find out more, visit http://www.worldmathsday.com/. New this year is World Spelling Day, taking place on March 3, 2011. Students play at home and at school against other students around the world in live spelling games. Each game lasts for 60 seconds and students can play up to 100 games, earning points for each correct answer. The students who answer the most questions appear in the Hall of Fame. Students can select their level and move up as they progress. There are 5 different levels of play, 20 games on each level. Learn more by visiting http://www.worldspellingday.com/. Both of these events are FREE and brought to you by 3P Learning. MOST. It is the Czech for "the bridge" and also the title of a touching short film centering around a sacrifice that saved hundreds of passengers heading toward an open drawbridge. Thirty-three minutes. That is how long the Oscar-nominated short-film MOST, directed by Bobby Garabedian, takes to share a compelling modern-day parable that "vividly portrays the greatest offering of love, sacrifice, hope, and forgiveness known to man." I didn't know much about the film, to be released in stores on March 1, other than it was an allegory. After watching the trailer (below), I got a sense for the emotional element of the story. The movie is subtitled (nearly all of the cast members speak Czech), which I felt actually added to the story, and was filmed in Eastern Europe. This Christian allegory is touching and more than just a little heart-wrenching. It is about choices, sacrifice, love for others - and change. The decision facing the father was a little hard for me to watch as a parent, but that was the point. The film is meant to get you thinking and could serve as a beginning of a family discussion about the message. There is a short Study Guide included on the DVD with discussion questions. 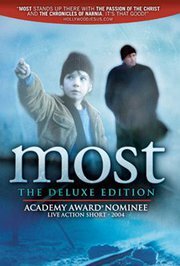 Also included is Making of MOST, a behind-the-scenes look of the trials and successes of the production of MOST. NOW CLOSED! Congrats to Natalie, comment #7. I have an extra copy and you have an opportunity to win your own MOST DVD. The giveaway will end on February 28th at 6 p.m. EST and will be chosen by a random number generator. Have you ever felt discouraged when you see homeschooling magazine covers portraying the perfect homeschool family, complete with 10 identically dressed smiling children that you just know never fight, have spotless bedrooms, and always get their advanced school work done early? I know that my family photo would not look as serene. Homeschooling for the Rest of Us, by Sonya Haskins, is meant as an encouragement to those who don't exactly fit the perfect homeschooling family mold. Through personal stories and a conversational tone, Haskins covers the concerns of a beginning homeschooler, Questioning relatives, messy homes, schedules, nurturing a child's heart, special needs children, homeschooling on a budget and, yes, even the socialization question are all part of this down-to-earth and practice guide to real-life homeschoolers. 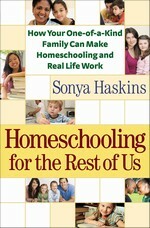 Haskins gives very specific tips, schedule examples, chore lists, life skills to teach, field trip ideas, and more. While I, a veteran homeschooler, didn't find this title very useful, it is sure to be a refreshing read as encouragement for those just beginning. Disclaimer: I was provided the product free of charge by Bethany House in exchange for my honest review. I have received no other compensation. Even though my son has not yet entered the teenage years, I found What Your Son Isn't Telling You, by Michael Ross and Susie Shellenberger, great preparation in “unlocking the secret world of teen boys". Having been a teen girl at one time, I felt a bit more equipped when my daughter entered the teen years. However, I recognize that teen boys are entirely different creatures and the turbulent teenage years of boys were not going to look the same as girls. Through discussion of topics such as the needs of teen boys, risk taking, anger and depression, potential battlegrounds, rejection of Christianity, and sexuality, the authors help parents reach and assist their teen sons though greater understanding. I found the numerous quotes of teen boys throughout the book to be especially helpful. Ross and Shellenberger give parents a glimpse into issues that concern a teen boy the most, where the greatest challenges lie, strategies to walk along side your teen son, and how to keep the communication lines open. 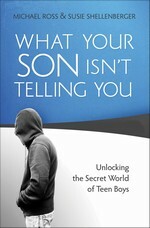 This is an excellent read for both moms and dads, even if your son has not hit the teen years yet. After reading What Your Son Isn't Telling You, I certainly feel better equipped for when I'll be mom to a teenage boy in a couple of years. For over a year, I've been contemplating a Kindle, Nook, or some other reading device. When the price for a Kindle dropped, and then the new Nook color came out, I thought about it even more. The problem...I didn't know which one, nor if I would really use it regardless of how much I wanted one. I liked that I could check out library books with the Nook. Kindle is not compatible with the loaning program and many titles on Google books as well. However, I also learned that Calibre could possibly convert files. More thinking. However, after I looked at all the free titles available directly from Amazon, in addition to having $100 from Christmas gift cards, I was quickly swayed to go the Kindle route. While the Kindle seems to be neck-in-neck with the Nook for the ereader race, I felt they had a slight edge in the market overall. I also didn't have to come up with a bunch of cash to purchase one since I had the gift cards. In the end, I figured that when we are talking about the ability to carry thousands of books in a purse, one really couldn't go wrong either way . My new toy arrived yesterday. I love it already! I also realized that I'll have to keep this thing under security after watching my daughter eyeball it. Maybe I can convince her to get a Nook and we can compare. For now, the Kindle wins in my household. My daughter and I were walking down the halls of our local public high school when the above window painting jumped out at me. While I agree with the sentiments expressed above, I wish it weren't a reflection of what I feel may be the caliber of our public school education. I mean, if I were the English teacher in this school, I think it would take all I had to not edit the above written work. While this is, unfortunately, a common grammatical mistake, if I were responsible for the education of the students at this public school, I think a grammar lesson on proper verb usage, with an explanation similar to the one here, would have taken place immediately upon seeing the mistake. It makes me wonder if the mistake wasn't noticed. I wish it were true that I graduated from my public high school with a solid foundation for college and beyond. However, that wasn't the case. I'm a little bitter that my public school education wasn't sufficient. I wish it were true that I could say that I never make grammatical mistakes. Admittedly, I'm still learning what I should have learned many years ago, and I do make grammatical mistakes on occasion. If I were the one who had written on this window, I'd want it corrected so I could learn the proper usage. I'd expect that in a learning environment. When I pointed out the window to my daughter as we walked by, she indicated that I was being entirely too critical, as expressed by her eye roll and, "Oh, Mom!" However, she was educated on proper verb usage and immediately knew the reason for my complaint. If that weren't the case, she wouldn't have understood my distress without further explanation. Perhaps it was true that I was being too quick to look for fault in public education. It is entirely possible. 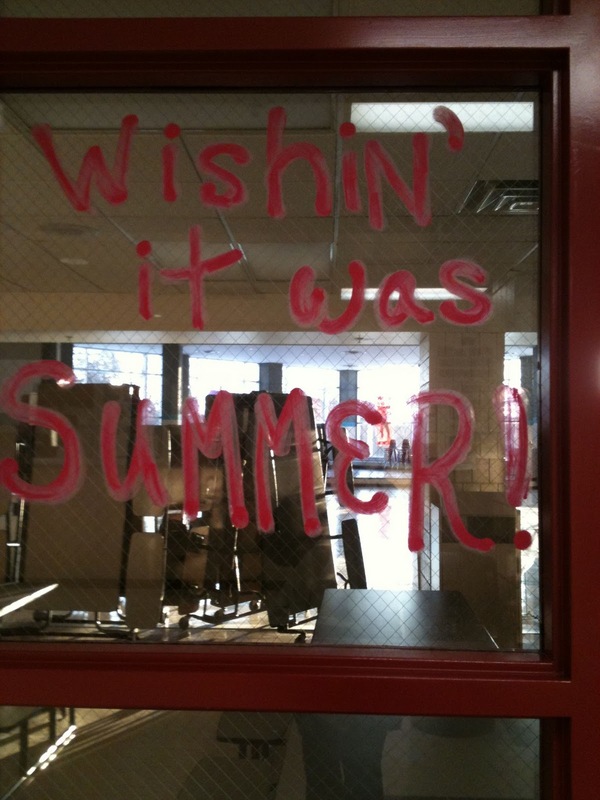 However, if I were one to not be concerned, my kids would be walking those very halls with the students who wished it "was" summer. 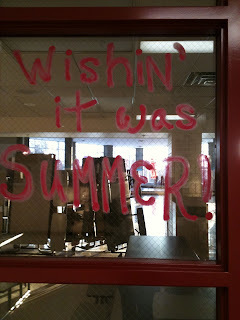 I do agree, though, on this cold February day, that I wish it were summer. My favorite Christmas gift this year was a 17" Dell laptop. I had been wanting a full-sized laptop for quite some time. I wasn't planning to use it much outside of the house, given it's size, but I was looking for the flexibility of having one in the house (and surfing the net while snuggled in bed!). However, I soon found I was dragging it out of the house. Several times a week I find myself waiting for my kids while the are involved in various activities and having a laptop along is quite handy. Unfortunately, I didn't have a case for it. Not that it stopped me...I ended up using a canvas tote. It wasn't very convenient, though. In comes in black as well, but I liked the red. This is a very spacious case with enough extra pockets to tote books, papers, cords, etc. In fact, the first day I used this case, I thought I lost my checkbook. I thought I had searched every pocket of the case, and then went through my car looking for the "lost" checkbook. After returning empty handed, I found my checkbook in a pocket that I had forgotten to check. Yup - there is enough space in this case to loose things! This is a nice sturdy laptop case that suits my needs just the fine. If you are looking for a case for your laptop, there are thousands of options at CSN Stores. My daughter has been taking an art class with our local support group. 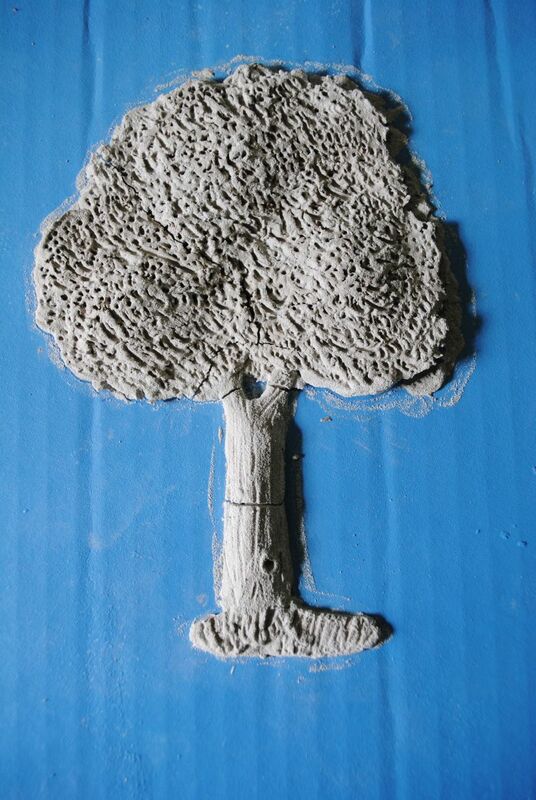 Each class starts with a bit of history on an artist and then the students complete a project in similar fashion. She's enjoying the class, both for the content and the company of her friends. This week the class learned of the first great sculptor of the Renaissance, Lorenzo Ghilgerti. 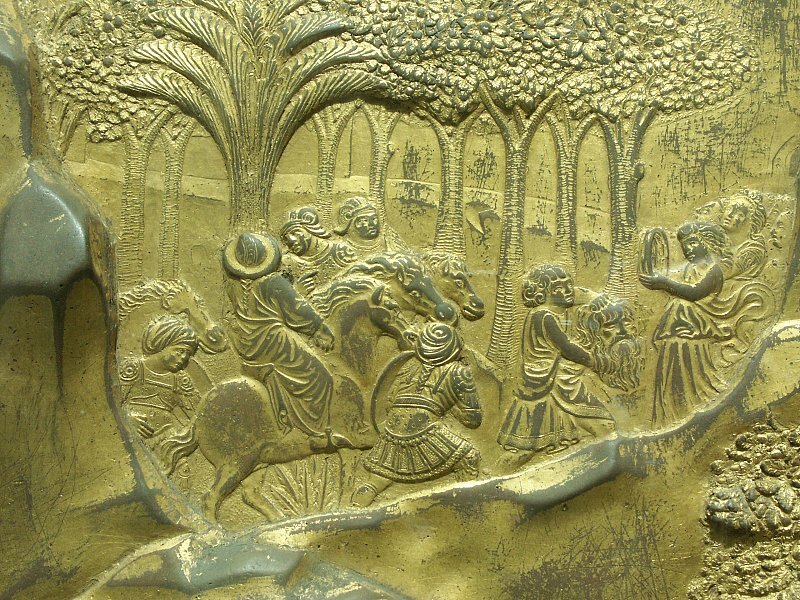 Ghilberti won a competition to design a set of doors for the Baptistry of the Cathedral in Florence in 1404. He spent the rest of his career working on these and another set, called (initially by Michelangelo) "The Gates of Paradise". I think the project this week, experimenting with bas relief sculpture in clay, was dd's favorite so far. Unfortunately, I didn't get a picture yesterday before the piece started to dry and crack. Note that this tree has leaves...a reminder that the trees aren't always bare in the freezing cold Michigan winters (February in Michigan is always the hardest!). Her teacher shared a website where you can see pictures of copies and the originals (in the Duomo museum) of the work. You can see for yourself here. Below is just one of the many pictures of the original. I picked another one with leaved trees. Come on, spring! The "front door" collapsed a bit, but there is still room to crawl into this 2-room quincy. It is well-known that part of prepping for the SAT exam involves vocabulary study, as evidenced by the numerous vocabulary programs geared toward high schoolers prepping for this important exam. One of the options is VocabAhead, available in DVD-Rom or book form. I was sent the DVD version, which contains over 12 hours of audio narrations covering 1180 words in a variety of formats, to review. Both MP4 video and MP3 audio files are included for each word to be played on a computer, a MP3 player, or an iPod. The video segments start with the word and definition, with the part of speech in the upper right-hand corner. Next, a cartoon is shown with the narrator giving a related story or stories, then a repeat of the word and definition. Each video segment is about 30-40 seconds long. The audio files are simply the same as the video, without the cartoon. This format allows the user to use the product with a MP3 player and headphones, or while driving. I liked the format of hearing the definition, viewing a visual, and listening to a story. Having the definition wrapped up in a longer story, rather than simply hearing a definition, looking it up, or being given an example of the word used in a sentence, is a great tool for improving retention. However, I didn't always care for the story that went along with the definition. Some showed political bias, others had a focus on poor parenting. One definition used the story of a father questioning his child's paternity and another involved a pole dancer influencing "virtuous" men. Were the definitions explained clearly? Well, yes, but were such story lines really necessary? There was an obvious attempt to appeal to teenagers that resulted in a product that was of lower quality than it needed to be. That said, I like the approach and the questionable definitions are limited to about 2%, as determined by viewing a random sample of the videos. The product really could be greatly improved with some rewriting of the 2% in question and a little thought behind the stories that go with the definitions. My daughter has a very high discernment and typically sees through any hidden agendas, so I was less concerned about her being influenced. Overall, she said it was "ok", which means she learned some new vocabulary, and neither the good nor the bad was overwhelming. Does this product improve a student's vocabulary? Yes, I believe that it gives the student an understanding of the words presented in a way that is unique to other programs. However, I would not recommend this product for kids younger than high school, unless you are willing to preview videos. It could be an effective tool for older kids, but parents should be aware that definitions may not always be appropriate. I equate it to a movie that has a great story line and message, but contains enough sexual innuendos and foul language thrown in, that it starts to outweigh what makes it a good movie. The advantages of wading through the negative to be exposed to the positive greatly becomes a reflection of individual tolerance. 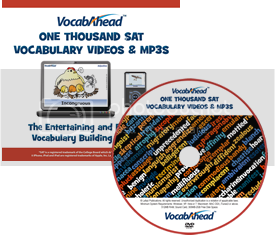 Fortunately, you can view about 90% of the videos on the DVD for free at the VocabAhead website along with have access to many other resources, such as the Study Room , a Word of the Day email subscription, a word list, and more, to make a personal assessment. The advantage of purchasing the DVD, which retails for $24.95 on Amazon, is that an internet connection isn't necessary for viewing and the files can be downloaded on an iPod or MP3 for on-the-go listening. Also available for purchase are a book with 300 of the words (and a link to download the corresponding videos) and applications for the iPod and iTouch. Read what other reviewers had to say about VocabAhead by visiting the official TOS Homeschool Crew blog. When my son was younger, he used to love those kit with a block of dried earthtone clay that contained buried treasure inside. He would chip away with the little tools included in the kit and be in pure archaeological heaven. Oh the mess those things made, though! If we weren't careful, there dust and dirt ended up everywhere. And while those kits were a ton of fun, I'm not sure he learned a whole lot other than Mom gets a little bent if he dumps a tray of clay particles on the floor. Do you have a budding archaeologist? Combine that love with technology for a fun (and clean) learning experience about archaeology and Roman life with Roman Town. Roman Town by Dig-It! Games and founded by a professional archaeologist and teacher, is an archaeological simulation game that combines the thrill of "treasure hunting" with real information about ancient Roman life. Seeing the game in action is probably better than any description I can provide. Please view the video below to get an idea of how all the features of the game work. My son quickly became addicted to this game. Knowing it has educational value, he didn't hesitate to suggest that he play the game for school, often instead of something dreaded - like writing! The interactive nature and ability to discover artifacts was appealing and I liked that he was learning quite a bit about Roman culture. The game isn't limited to just learning about a culture, though, and approaches the topic through "hands-on" activities, analysis, problem solving, reading comprehension and vocabulary. My son liked the "digging" for artifacts the best, along with the puzzles. He also said that he learned quite a bit about Roman culture through the activities. 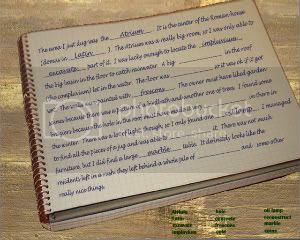 One thing I liked was the knowledge tests or journals, which required the user to fill in the blank with the appropriate word. My son said they made him think. Users work through various levels and come to a point where the game is "completed". However, new artifacts to be uncovered each time the game is played again keeps repeat plays from being too repetitious. In addition, up to five different players can play and save their games. Even so, I'm not sure this is a game that my son would play over and over once all the levels are completed. I do see him being excited about a continuation of Roman Town. Coincidentally, Dig-It! Games is currently in the early stages of developing additional Volumes 2 and 3. Dig-It! suggests the game for ages 8-88. While my 6th grader enjoyed the game, my 8th grader really wasn't interested when she saw her brother play. I'm not sure if that is a reflection of the level of the game, her indifference to most computer games, or the fact that she already knows more Roman culture than most her age. Regardless, I think mid-elementary to early middle school students with an interest in archeology will find Roman Town engaging. If you don't have a strong reader, keep in mind that the user needs to read the material on the screen; it does not read it to you. Overall, I thought Roman Town was a great combination of fun and learning. My son had a ton of enthusiasm for the game and diligently worked through the various levels. I think Roman Town would be a perfect compliment to early Latin study or to supplement related history topics. Winner of the National Parenting Center's 2010 Seal of Approval and Dr. Toy's Best Vacation Products, Roman Town is regularly priced at $39.95 for a CD version. However, using coupon code TOS2011, Roman Town is just $19.96 - a significant savings! The coupon code is only valid through February 21, 2011, so act now if you'd like to get in on the special pricing for TOS Crew readers. You will not find this offer advertised on the Dig-It! Games website. Read what other reviewers had to say about Roman Town by visiting the official TOS Homeschool Crew blog. Earlier this year, there was a Blog Cruise question about incorporating technology into your homeschool. Though I imagine there are some that use very little technology, I personally can't imagine homeschooling without it. My daughter's American History class has several projects throughout the year. Usually she is given flexibility in how to complete the projects. This past semester she had two large projects, both of which she decided to present with technology. Her work on both of these projects was very focused and she completed them both well before the due date. That is saying a lot for Miss Procrastinator. Obviously she enjoyed creating them, and I enjoyed seeing the end result. I just wanted to share them as examples of how technology can be used for learning. I hope that gives some ideas for how you can use technology for homeschool projects and learning. It's educational, green, motivating...and in our house...painless! When I discovered that the fairytale audio CDs by 6 Pence Productions are voiced entirely by children 5-17, I was immediately interested. If you've been a reader in the past, you've probably figured out that both of my kids enjoy theater. Combine that with a love of audiobooks and an appreciation of an imaginative story, and the "stage" is set to enjoy a CD by Audio Theatre for Kids - By Kids! I received two CDs for review from 6 Pence Productions: The Fairytale Collection ($14.95) and Princess Reform School ($19.95). The Fairytale Collection, which has a total running time of almost an hour, retells five classic fairytales. However, the retellings aren't exactly the versions you remember. Three Billy Goats Gruff, Cinderella and Friends, The Emperor's New Clothes, The Three Little Pigs Meet the Big Bad Wolves, and Princess and the Pea are presented with modern flair and unexpected twists. The suggested age range for this CD is 3-8. It will be enjoyed more if listeners have previous knowledge of the original versions, but they are enjoyable enough as is. The second CD, the Princess Reform School, is suggested for ages 6-13. Rather than separate stories, the CD is one 1 1/2 hour story, based on the a play originally performed at Flat Rock Playhouse, The State Theatre of North Carolina. The story is about some rather unconventional princesses attending a reform school to make them better at being "princessly". The underlying story revolves around the self-acceptance of girls while navigating societal expectations and pressures. My kids were on the older side for these CDs. My daughter, who does a fair amount of snubbing societal expectations for girls, would have loved Princess Reform School around the age 8 or 9. Even so, she still claimed the Princess Reform School was "cute" and proceeded to tell me the names of several younger girls that she thought would love it. It also isn't so girly that boys can't enjoy it, though it wouldn't be my first choice for boys. My son dubbed it a "chick flick", but I also noticed that he chose to listen to it over lunch rather than stick his nose in a Star Wars book. I plan to give The Fairytale Collection to my 5-year-old niece to enjoy. She's the perfect age for this CD. What I liked the most about both CDs was simply the performance of the kids. They were exceptional and the CDs were very professionally done. And I have a sense that the whole cast tremendously enjoyed producing the CDs. With one child who is about all things theater and performing, it was fun to listen to these imaginative stories done entirely by kids. There are sample tracks available on the 6 Pence Players website, where you can also make a purchase of both titles. Disclaimer: I received both CDs free of charge in exchange for my honest review. This is my son after snow blowing the driveway this morning.